EXPERIENCE THE LUXURY AND EXCLUSIVITY OF FISHER ISLAND AT THIS FULLY RENOVATED 1 BED/1 BATH OCEN VIEW CONDO. YOU WILL BE ENJOYING A 720 SQ. FT. LUXURIOUS CONDO ON FISHER ISLAND!! ALL RENTALS INCLUDE USE OF OWNERS GOLF CART and ALL THE LUXURY OFFERED ON WORLD-FAMOUS, PRIVATE FISHER ISLAND!! CALL MIRA TODAY AT (305) 926-5301 TO BOOK. If you are seeking the ultimate in luxury for your next South Florida stay then this magnificent 1 bed/1 bath unit on exclusive Fisher Island is the destination for you. Defined as a world-class destination for those seeking unrivaled luxury in a lush, relaxed setting, Fisher Island was once the home of the Vanderbilt family and is accessible only by private yacht and Fisher Island’s auto-ferry service. 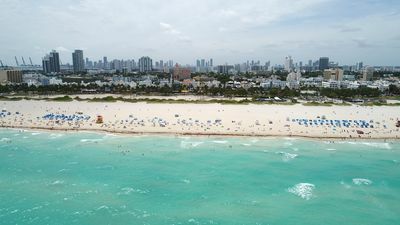 Just off the coast of Miami Beach you are close to all of the great restaurants and nightlife that South Beach has to offer while secluded on a private island with world class amenities. This luxurious 1 bed/1 bath oceanfront residence is located within the Seaside Villas community on Fisher Island. The Seaside Villas are spacious, waterfront buildings, each with up to six well-appointed units. The villa includes an incredible ground-floor garden terrace with spectacular views of the Atlantic ocean. 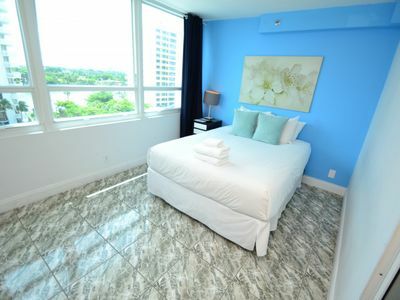 Inside, this newly remodeled unit includes all the conveniences and luxuries of home. Top of the line kitchen appliances with granite counter-top perfect for preparing gourmet meals while relaxing in your spacious living room will offer you a superb, relaxing stay. Unit includes use of owner golf cart to get around the island at your convenience!! Discover exclusive shared facilities on the grounds of Fisher Island, including a sparkling pool, hot tub, scenic paths and marina. 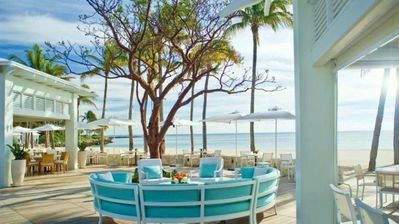 A required temporary membership to the Fisher Island Club will open the doors to a world of five-star amenities, such as a white sand beach, spas, fine dining, golf, tennis and much more. 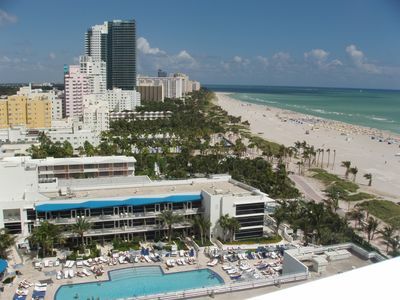 South Beach and Lincoln Road is a short drive with all the lively nightlife just a ferry ride away. Call or email today to reserve your stay on exclusive, Fisher Island. Most amenities and restaurants on Fisher Island are managed by the Fisher Island Club which is not affiliated to the Seaside Villa community. Upon arrival it is recommended to register with the Fisher Island Club and become a temporary member. The Fisher Island Club will provide you with a membership card enabling you to access the gym, spa, tennis center, beach club, golf course and all of the exclusive amenities offered at Fisher Island. A local incidental account will be opened for your visit and the membership fees will be applied to it. All major credit cards are accepted to settle your account directly with Fisher Island Club at the end of your stay. Fisher Island's luxury villas offer numerous amenities. These include six fabulous restaurants, full-service resort spa and gym with trainers, 18 tennis courts, 9 hole Pete Dye designed golf course, full service marina accommodating boats and yachts up to 250 feet, Tiki bar, Sushi bar, children's play ground, car wash, epicurean shop, dog park, and private mile-long beach with beach-front restaurant. Incurred incidental fees will be added to your Fisher Island Club account.